All matters military, militia, regiments and the like. Army, Navy, Air Force etc. Afternoon all! I have very limited experience with military records, and the few military men in my family tree served almost exclusively with the Seaforth Highlanders (couple Gordon Highlanders, and a pre-amalgamation 92nd Highlander in there too) so this is stumping me. My dad gave me a collection of photos from his side of the family, and most of the people in them are identified - apart from one formal portrait of a soldier that nobody seems to know the name of. I'm looking to see if I can narrow down the regiment, rank, time period etc. based on the photograph and see if it matches up with any known military men in the family - it wouldn't be definite proof, but it would be a possibility. Can anyone advise resources I can use to do this? If anyone recognises any aspect of the photo, please feel free to chip in! Interested in: McGillivray (Moray and Aberdeenshire), Alexander (Moray and Aberdeenshire), Strathdee (Moray and Banffshire), Williamson (Moray and Ross-shire) among others. Sadly I have no idea about anything you have asked - but what a fabulous photograph. Do hope you find out who it is and where he served. Edit: This website has hundreds of examples - could take some time to get through them all! Greetings. 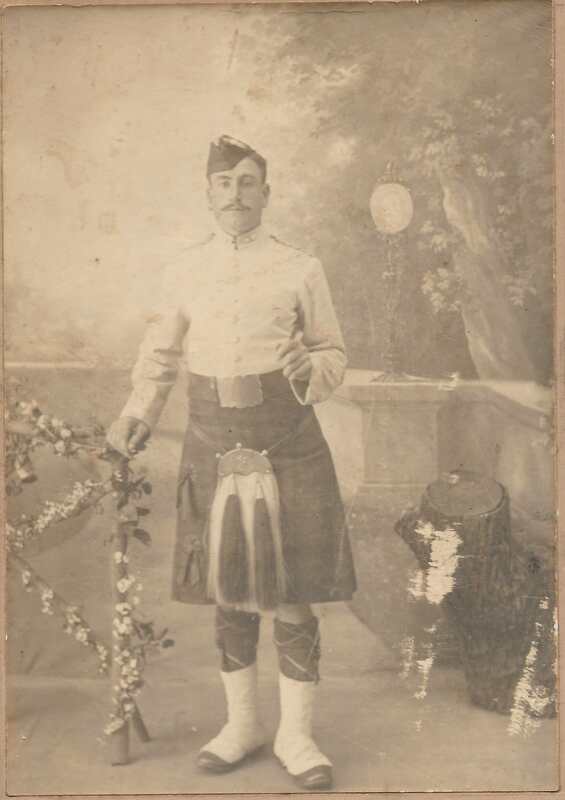 A little late, perhaps, but it has been suggested elsewhere that this man is a piper of the Royal Scots Fusiliers. The grenade badges on the collar of his musicians' white Drill Jacket are a traditional fusilier emblem. Although a Lowland Regiment, recruiting in south west Scotland, the RSF had a kilted pipe band. Pipers wore piain blue Glengarry bonnets while the rest of the regiment wore the Glengarry with a band of dicing, They wore a version of Black Watch tartan. Hope that is still of help.